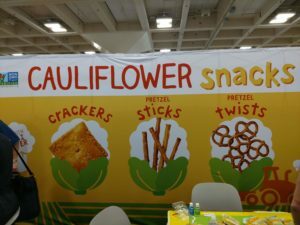 On the first day of the Fancy Food Show, I read the Show Daily lead story pointing me to highlights of global flavors, cuisines, and functional ingredients that the article said I’d find throughout the show. Within minutes, while staring on the second floor in the New-to-the-Shelf section, I found exactly what the article highlighted! I quickly found flavors from Africa, Latin America, and South Asia. My first find was a shelf-stable set of Indian Curries from Meal Mantra. The emerging brand started in Commonwealth Kitchen and kept moving with their product line. Their Tikka Masala was a delicious, smooth and creamy sauce which is a staple found in almost every Indian restaurant around the world. Authentic taste and a very easy meal to prepare when you are in a hurry. In the same startup section, I also found Don Chili0 by Kreative Gourmet who had an interesting chili crisp. 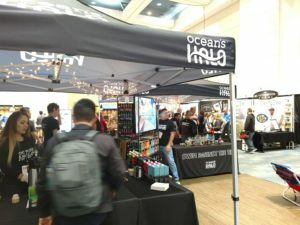 In the larger hall upstairs, I was happy to find a company with the Safe Quality Food (SQF) designation, Frontier Foods with their Ocean Halo brand, who showcased their ramen, sauces, broths, and a new line of beverages all made from ocean kelp (seaweed). In the South Hall, I found a traditional Ethiopian spice blend as a Berbere Sauce from Mama Kicks. They have a great brand story with their focus and give back is to grassroots organizations in the towns and villages where our recipes have their delicious origins, helping the women there achieve independence and success in business. 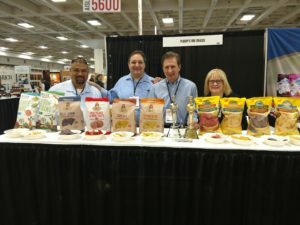 I also met with the team from Hola Nola Foods who have a great brand of chips where the bag is microwavable so you can serve warm chips at home. One of their chips is made with red beans and rice…yum. For functional foods, gut health continues to gain awareness with consumers and producers are bringing more fermented beverages to market. 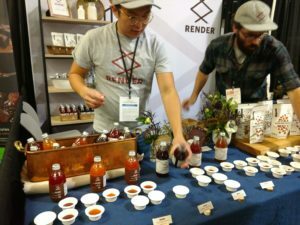 The team from Render Foods had some interesting Breyner which is a savory vegetable drink to enjoy on its own or mix with a favorite spirit for restaurant quality cocktails at home. The Breyner is made from upcycled pickle brine, tomatoes, vegetables, vegan Worcestershire, and spices. They partner with a local Sonoma pickle brinery to repurpose the brine from their pickle making that would otherwise be discarded. They also had a line of Weyla which is a sparkling, fruity, sustainable beverage made from upcycled whey, fruit, herbs and botanicals. Slingshot Foods had portable breakfast shots with chia, protein and probiotics and ZenBasel hydrated organic basil seed prebiotic drinks. I also grabbed a wellness shot from Ginger Shors Tulua Wellness which blend together unique combinations of highly functional ingredients. The Turmeric Wellness Shot brings together the mighty root cousins turmeric and ginger, both widely acclaimed for their anti-inflammatory properties and other health benefits. Cold-pressed pineapple juice and a touch of black pepper round out this smooth and balanced wellness shot. The Tulua Wellness Shot Apple Cider Vinegar is a powerhouse blend that includes cold-pressed lemon and ginger juices and was my recommendation for a colleague fighting a new cold. Another drink I found was Bolero, an advanced hydration drink that had good taste and ingredients. In the Front Burner Pitch Competition, Victoria Ho from Pacific Pickle Works was very impressive with a Michelada Shrub (and that’s not something you plant in your yard.) The drink taken from a traditional Mexican beverage combines fresh lime juice, apple cider vinegar, Worcestershire sauce, and spices to create a spicy yet refreshing mix that can be combined with beer, hard alcohol or tomato juice. There continues to be an emphasis on healthy snacking. I was thrilled to see the Grandy Oats company from Maine. I recently found their products at Lowe’s Foods in North Carolina and my son has been devouring their granola. Turns out, one of their lines is Coconola and will drive you to empty the bag quickly. Hippie Snacks had cauliflower crisps in several flavors. Found in the KeHe booth, Zuma Valley Coconut and Mango Snack Balls were interesting with only two ingredients and no added sugar. I enjoyed the special exhibit from The Future Market which focused on one the themes driving the future of food sustainability- biodiversity. According to the United Nations Food and Agriculture Organization, about 72 percent of the world’s food comes from just 12 plants and five animal species. The concentration around just a few foods makes our food system less resilient to threats like disease, pests, and climate change. It also ignores the deliciously diverse bounty of thousands of underutilized foods across the globe and the communities that cultivate them. 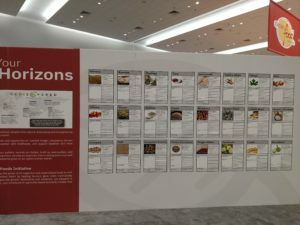 You can see from the Horizons ingredient wall some of the alternatives to contribute to biodiversity. 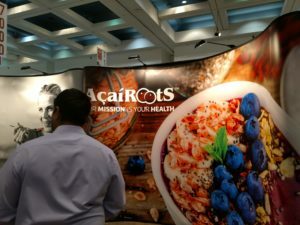 For the full photo album of the Fancy Food Show floor, take a look at the album here.